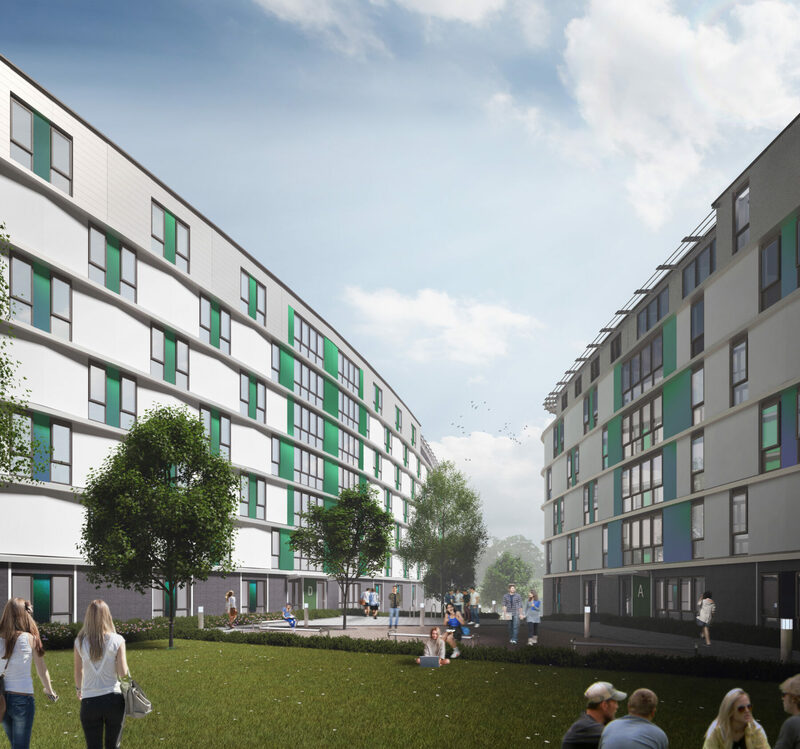 Meadows Phase Two is formed of two striking curved buildings located at the gateway to the campus. The built form responds to the two bands of trees that define the site and reflect the design concepts from the original Capon campus masterplan. 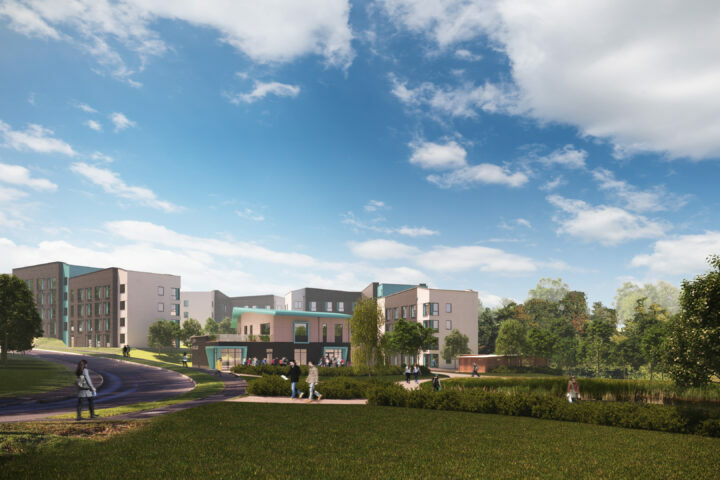 Uliving and the University asked Willmore Iles Architects to negotiate the resolution of a detailed planning application for this important gateway site. The scheme concept and scale of the two curved buildings was agreed, however, the parties could not reach agreement on the detailed appearance of the building. 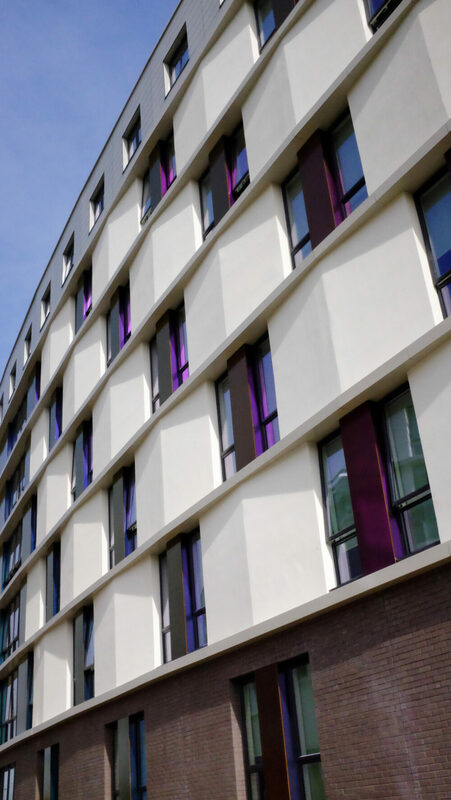 Our task was to maintain the ‘woven’ lightweight appearance of the façade with an affordable construction solution. 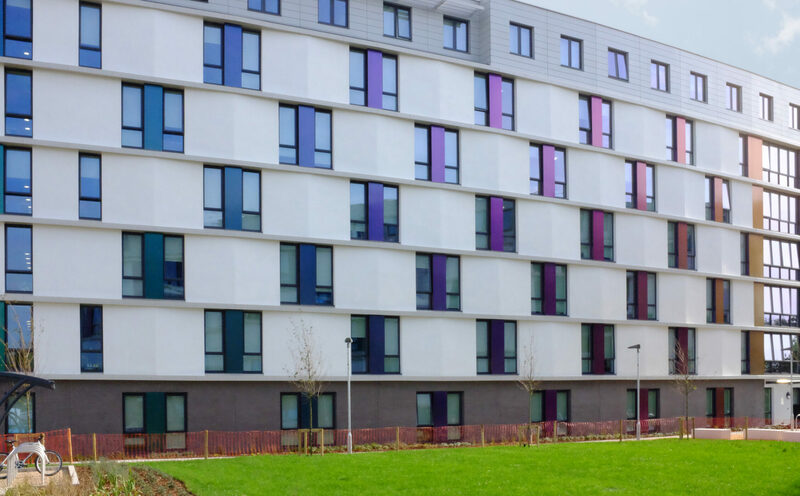 We achieved this by using a combination of full height windows, sculpted façade treatments and an iridescent panel to enliven the white render façade. 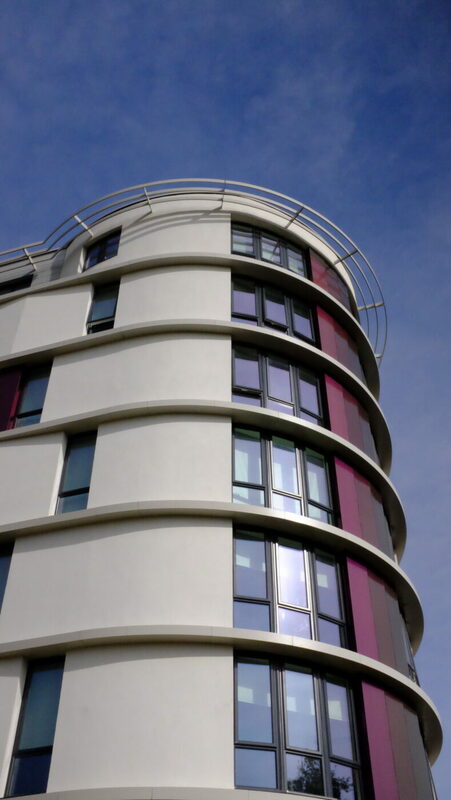 The curved ends to the buildings were substantially revised and now echo the Essex coastal modernism of the 1930’s. These changes addressed the Planning Authority’s concerns and planning approval was granted through delegated powers. In parallel with the evolving the design concept, we worked with the construction team to simplify the construction process. The curves, weave and ‘v-panels’ were rationalised to ensure buildability but retain the purity of their true curves. The building is constructed using in-situ poured concrete – so it was important to eliminate curved formwork to reduce costs. Panelised construction significantly reduced the need for scaffolding; again, helping to make the scheme affordable. Each building contains a variety of flat types. 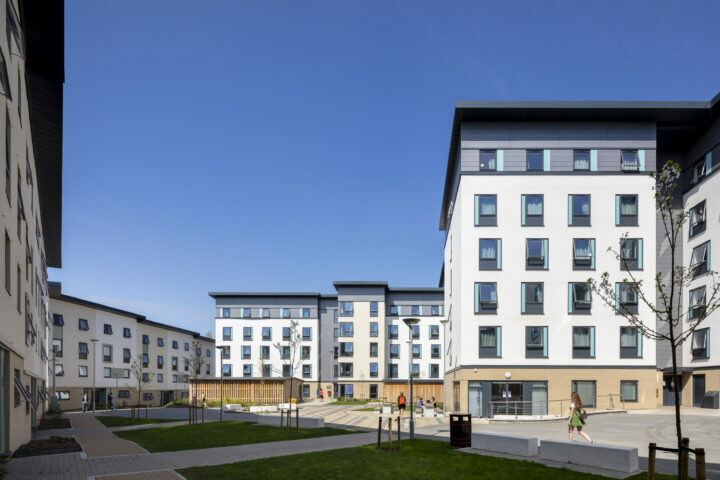 A large proportion of the flats have their front doors accessing directly into the kitchens. In comparison to a typical corridor access flat, this gives a homelier feel and provides another level of privacy to the bedrooms. 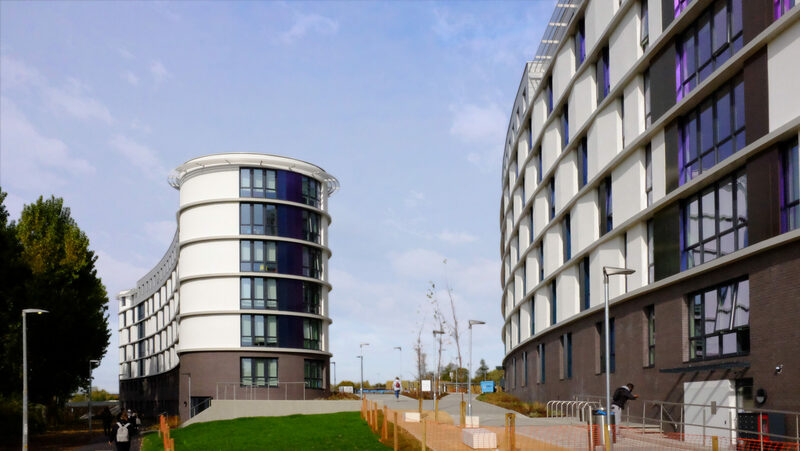 The flats at the ends of the buildings have dramatic semi-circular living spaces with great views over the River Colne water meadows.